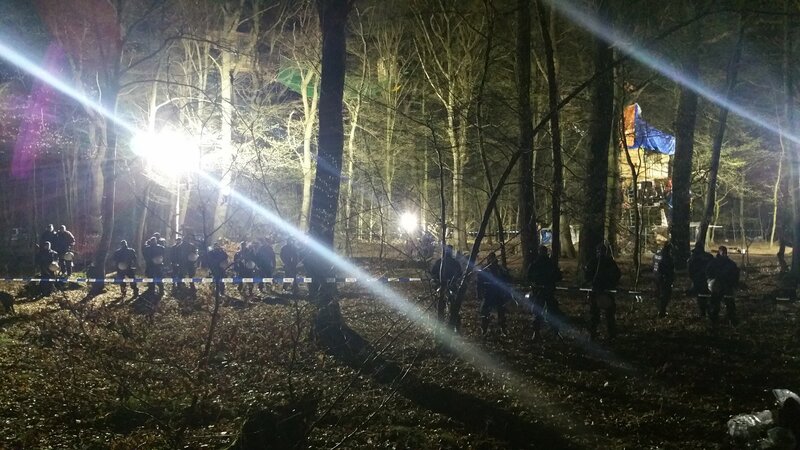 Hambach Forest – We are occupying the Hambach Forest, against its destruction and for more climate justice. The Hambacher Forst is an ancient forest near the city of Cologne (Germany). This autumn, the forest is to be clear cut in order to expand a climate-destroying open pit coal mine. 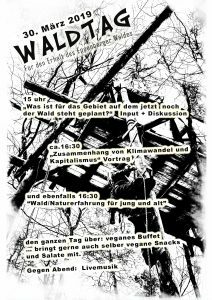 Since September 13th RWE is evicting the forest occupation and destroys vast parts of the woods. 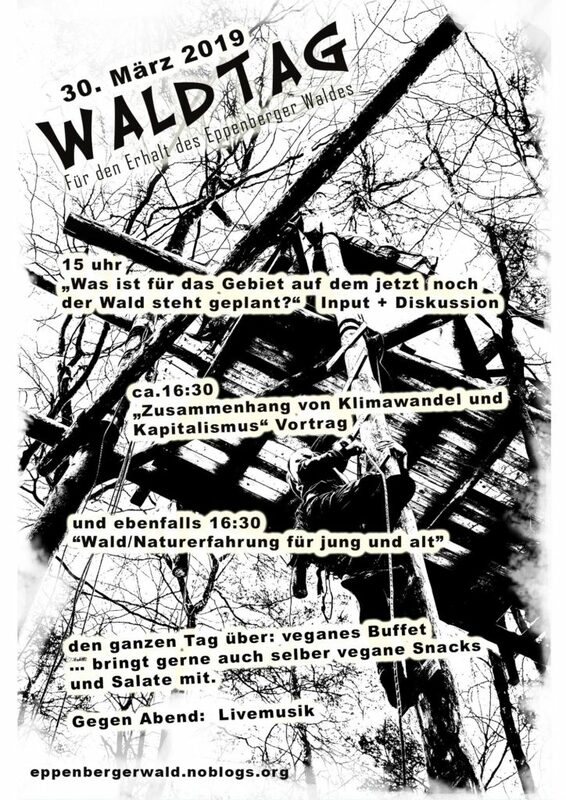 Every Sunday during a walk in the woods thousands of people send a signal against the destructiveness of RWE and short-sighted politics. Join us in the Hambacher Forst: For climate justice – now and everywhere! There are three coal pits and five powerplants in the rhineland. Together they produce one third of the german carbon dioxide emission. These greenhouse gases change the climate worldwide, lead to more weather extremes and the destruction of habitats of humans and other animals. The humans who suffer first from global warming are not those, who are causing the harm, but those in the global south. Together we can stop the destruction! The future of our planet is in our hands. It is time, that we come together for a sustainable and just world beyond the deadly logic of capitalism. Together we can save the forest and the climate and create a world, in which no living being is exploited. We established a camp in Manheim, close to the forest. The skillshare workshops take place here and everybody can find a warm meal and a place to sleep in order to rebuild their energy for preventing the clear cutting. Every Sunday the traditional walk in the woods takes place. It usually starts at 11:30 from the train station Buir. It is the best opportunity to get to know the forest, the people and the resistance! Since September 13th RWE is evicting the forest occupation and destroys vast parts of the woods. Trees are being cut, even though a court prohibited the cutting for the time being. People are constantly being put in jeopardy and last Wednesday, a friend of us died during a police operation. On March 22, 2019, we meet at the gravel pit at 10:00 o’clock, equip ourselves with garbage bags, garbage tongs and gloves to clean the forest from the garbage. At 3:00 pm the garbage will be picked up. Collecting point is on the L276 at the parking lot next to the slip-road to the ancient motorway A4. In the afternoon of Friday, march 15th, Eule was released from the prison in Cologne-Ossendorf. The district court of Cologne overturned her arrest warrant in the course of a complaint. According to the competent judge at the district court, an almost 6-month detention was no longer proportionate. For Eule, the lifting of the arrest warrant is not subject to any conditions.